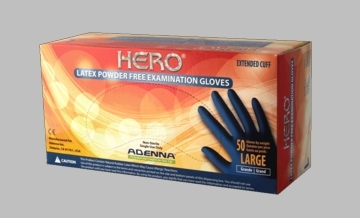 HERO® is a 14 mil thick, extended cuff, powder free latex exam glove designed to provide the highest level of protection for high-risk and heavy-duty applications. The glove fingers are almost 4 times thicker than regular latex exam gloves. HERO® glove is about 12 inches long provides coverage over the wrist and forearm for additional protection. This glove comes in a dark blue color and is ideal for EMS, trauma, law enforcement, mortuary, laboratory, mid to heavy mechanics and industrial use. With greater strength, you get a glove that is safer and more durable to work for longer periods of time.